Featuring Hamish Bowles, Leslie Caron, David Hockney, Isaac Mizrahi, David Bailey, Manolo Blahnik, Susanna Brown, Peter Eyre, Philippe Garner, Ray Gurton, Nicky Haslam, Alastair Macaulay, Robin Muir and archival footage of Cecil Beaton. Distributed by Zeitgeist Films. 99 minutes. Not Rated. Cecil Beaton lived his life unapologetically in the search and capture of beauty. Love, Cecil weaves a whimsical and visually stunning look at Cecil the photographer, the writer, the (drama) queen, and most of all, the purveyor of beauty. The film follows a linear timeline, starting with Cecil’s childhood, capturing his past through historical film clips, interviews (past and present day), personal diary excerpts, a whole lot of (pre-selfie) selfies, and most importantly, his photos. From his early days staging and photographing his sisters, it was very clear that Beaton had an eye for the unique shot. His photos, at times dramatic and silly, are stunning. Through interviews, we learn that Cecil had a difficult relationship with his father, particularly after dad caught him at his mother’s make up mirror as a young boy. Despite his strained relationship with his father, he followed his passions and pursued a life of art. His camera became his passport into a more fashionable life then he was born into. Beaton attended Cambridge University for three years, and while never completing a degree (and skipping out on lectures), he spent his time developing passions in Italian Renaissance, Russian Ballet, theater (particularly theater scenery) and photography. He would dress in drag, not as an act of rebellion or provocation, but as an independent expression of self. At school, he self-promoted his work by sending photos to news outlets to encourage attendance. Early on in Love, Cecil it is easy to wonder if Beaton was a man ahead of his time? While his art seems anchored in past eras of elegance, Beaton’s presentation was very well suited for our current internet-based society. For sure, he would have felt right at home with current social media platforms. He easily would have been a sensation, particularly in his ability to mesh different art forms together. It is intriguing to see clips of Beaton with his camera, realizing that this was long before today’s digital, disposable shot age. Love, Cecil is delightfully filled with the eye candy that Beaton attracted and photographed. From photo shoots at Ashcombe, his home for 15 years, to Europe during and after World War II. Celebrities and movie sets, and not least of all, England’s royalty – they’re all captured in this documentary. It’s easy (and clinically inaccurate) to Monday morning quarterback diagnose that Beaton may have had an undiagnosed attention issue, but perhaps that contributed to his exploration of so many artistic pursuits. He felt he had little talent but was “tormented with ambition.” Well, for an entirely self-taught artist, even this film’s small glimpse into his artistry tells another story. His ability to capture the soul, emotion, and movement of his subjects was unique – marrying his love of theater with photography. Each portrait tells its own story. 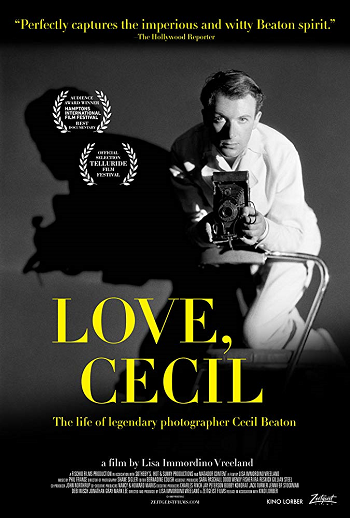 I feel certain that by the end of Love, Cecil, you will be searching the internet looking for more about Cecil Beaton, not because the film was incomplete, but to continue to immerse in his capture of beauty. Copyright ©2018 PopEntertainment.com. All rights reserved. Posted: August 3, 2018. Tags: Alastair Macaulay, Bonnie Paul, Cecil Beaton, David Bailey, David Hockney, drag, England, Greta Garbo, Hamish Bowles, Isaac Mizrahi, Italian Renaissance, Leslie Caron, Lisa Immordino Vreeland, Love Cecil, Manolo Blahnik, movie review, Nicky Haslam, Peter Eyre, Philippe Garner, photography, PopEntertainment.com, Ray Gurton, Robin Muir, royalty, Rupert Everett, Russian Ballet, scenery, Susanna Brown, theater. Bookmark the permalink.